One of the greatest mystery thrillers ever written, Wilkie Collins's The Woman in White was a phenomenal bestseller in the 1860s, achieving even greater success than works by Charles Dickens. Full of surprise, intrigue, and suspense, this vastly entertaining novel continues to enthrall audiences today. The story begins with an eerie midnight encounter between artist Walter Hartright and a ghostly woman dressed all in white who seems desperate to share a dark secret. The next day Hartright, engaged as a drawing master to the beautiful Laura Fairlie and her half sister, tells his pupils about the strange events of the previous evening. Determined to learn all they can about the mysterious woman in white, the three soon find themselves drawn into a chilling vortex of crime, poison, kidnapping, and international intrigue. Masterfully constructed, The Woman in White is dominated by two of the finest creations in all Victorian fiction-Marion Halcombe, dark, mannish, yet irresistibly fascinating, and Count Fosco, the sinister and flamboyant "Napoleon of Crime. Wilkie Collins (1824-1889) was an English novelist who critics often credit with the invention of the English detective novel. He is best known as the author of "Moonstone," "The Woman in White," "No Name," and "Armadale." 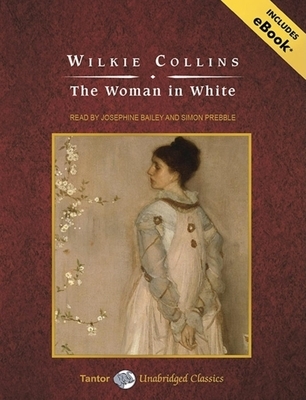 British actress and narrator Josephine Bailey has won ten "AudioFile" Earphones Awards and a prestigious Audie Award, and "Publishers Weekly" named her Best Female Narrator in 2002. One of "AudioFile" magazine's Golden Voices, Simon Prebble has received over twenty Earphones Awards and five Listen-Up Awards, and he has been a finalist fourteen times for an Audie Award. In 2006, "Publishers Weekly" named him Narrator of the Year, and he was named "Booklist"'s 2010 Voice of Choice.